ProPoster is software for big banner printing, sign printing, poster printing. Any picture, digital photo, Microsoft Word or Excel document can be used as a source for the poster. ProPoster can print standard format (A0, A1 A2) poster or custom large poster. Simply select the image and software will divide it into the necessary number of pages. To create a poster, you will also need glue, scissors and a bit of skill. Make a great poster yourself. ...... Simply select an image and the software will automatically divide it into the necessary number of pages. To create a poster, you will also need glue, scissors and a bit of skill. * Printing large posters with the size up to 10 x 10 meters. 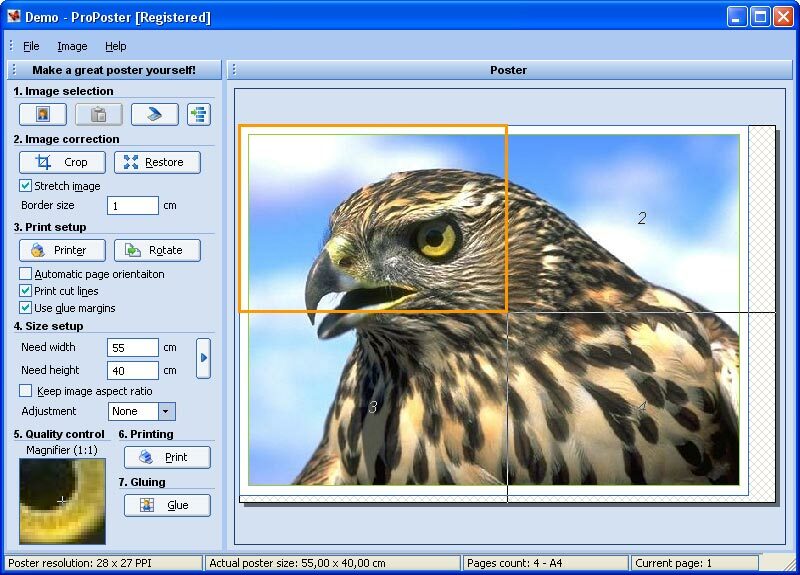 * ProPoster supporting various image formats (bmp, gif, jpg, wmf, emf). * ProPoster supporting copying data from standard Windows applications. * ProPoster supporting Metric and Imperial measurement units (mm, cm, inch). Qweas is providing links to ProPoster 3.01.12 as a courtesy, and makes no representations regarding ProPoster or any other applications or any information related thereto. Any questions, complaints or claims regarding this application ProPoster 3.01.12 must be directed to the appropriate software vendor. You may click the publisher link of ProPoster on the top of this page to get more details about the vendor.